This article is about the pigs from Paper Mario: The Thousand-Year Door. For other pigs, see Category:Pigs. 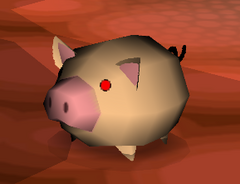 Pigs are animals that have appear throughout the Mario series, but unlike their real world counterparts, Pigs are often shown to be anthropomorphic or capable of speech. In Paper Mario: The Thousand-Year Door, Doopliss turns the citizens of Twilight Town into Pigs with the ring of a bell. When Doopliss is defeated, everyone is turned back. The title of the chapter in which these events take place is called "For Pigs the Bell Tolls", which is a reference to the novel written by Ernest Hemingway called For Whom the Bell Tolls. This page was last edited on November 2, 2018, at 12:34.